When a carer and her charge are stranded in a forest, both have a chance to find closure on grief. Japan is home to the world's most notorious forest - Aokigahara, which has become known as the 'Suicide Forest' (as seen in such recent films as Gus Van Sant's Sea of Trees and the insensitive horror yarn The Forest) thanks to its popularity as a destination for those intent on ending their lives. According to Japanese mythology, Aokigahara is said to be home to spirits of the dead, known locally as 'Yurei'. Forests have a special place in Japanese culture. It was the country's Zen masters who first asked the eternal question, "If a tree falls in the forest and no one hears it, does it make a sound?" Escaping from the rush of Japan's enormous cities to the serenity of the woods is a national past-time. For the Japanese, a visit to a forest is a much needed opportunity to get in touch with something bigger than the day to day concerns of humanity. 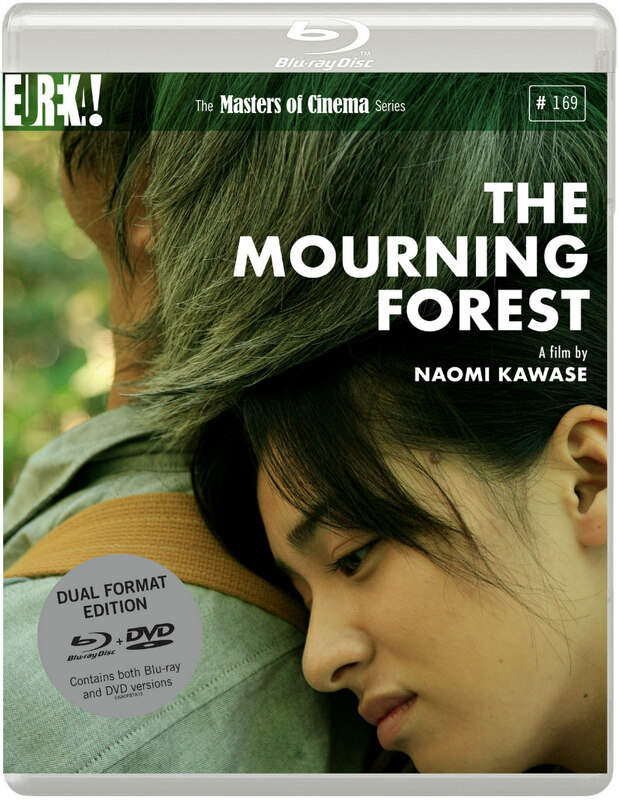 In Naomi Kawase's fourth feature, 2007's The Mourning Forest - which receives its blu-ray debut here courtesy of Eureka's Masters of Cinema series - the forest offers a chance for emotional closure for its two protagonists. Machiko (Machiko Ono) is a caregiver at a retirement home located in impossibly scenic surrounds. She throws herself into her work to cope with the grief of losing her young son in an accident the boy's father holds her responsible for. In Machiko's charge is Shigeki (Shigeki Uda), a widower suffering the onset of senility. He clings to a mysterious rucksack, turning violent when anyone dares wrestle it from his possession. To celebrate Shigeki's birthday, Machiko takes the elderly man for a drive in the country. When her car breaks down, Shigeki makes a run for a nearby forest, and Machiko is forced to follow. Despite her best efforts, she is unable to convince him to leave the forest. With his bag in tow, it seems Shigeki is on a personal quest. Ironically, Kawase's film loses much of its impetus once she sends her central pair into the forest. The early scenes are far more effective, as we witness Machiko and Shigeki slowly form an awkward bond, their mutual grief unspoken yet somehow understood by both parties. A playful aside has the pair play hide and seek among vast rows of shrubs on a steep hillside, and a beautiful aerial shot which dwarves them among the landscape reinforces the film's theme of human fragility. Once in the forest, dialogue becomes sparse, but Kawase fails to find a way to communicate her notions through her visuals, and we're left simply watching two characters plod through the bush for close to an hour. The film's strongest scene involves not Machiko and her charge, but the nurse and her superior, Wakako (Makiko Watanabe), as the two women rest for a moment in the latter's car and laugh at tales of former lovers. It's the sort of quiet, intimate scene Japanese cinema is known for, and frankly I wish the film had stuck with this pairing rather than the direction it takes. Last year's infinitely superior drama Sweet Bean, which similarly gave us a cross-generational dynamic, is proof that Kawase has matured considerably in the decade since The Mourning Forest's release. A bare bones package with a trailer, gallery and a booklet featuring a statement from Kawase. The transfer is up to the usual high standards of Eureka however. The Mourning Forest is released on dual format DVD/blu-ray from Eureka on August 21st.